The city council of Winfield, Ala., passed a resolution: “Whereas we acknowledge God is the owner of the City of Winfield and that it is a City under God. We acknowledge that at all times, He is in control.” Mayor Randy Price admitted, “It blew up on Facebook last night after the atheists got a hold of it.” The viral response came after the blogger known as The Friendly Atheist posted a response on his website: “I promise you God has better things to do than take over your city.” Price still stands behind the decision, though. “I feel like we need to stand up for what is right,” he said. “Our forefathers said ‘One nation under God’ and we went so far away from that. There are not enough godly people involved in day-to-day decisions,” he said. “There’s no other way; there’s no other God. There are a lot of religions out there but only one God.” (MS/Haleyville Journal Record) …Be careful: I hear if you eat any fruit from the trees, the landlord will evict you. Actually, going to ‘One nation under God’ went away from our forefathers: the de facto motto of the country, adopted in 1782 on the Great Seal of the United States, was “E Pluribus Unum” — “Out of many, one.” Or, to translate the idea more completely, out of many kinds of citizens joined together, we become one nation” — the “melting pot” we used to talk about in this country, even in my lifetime. Not anymore: now it’s “us vs them” …when in reality, we’re all “them”; we all moved to this continent from somewhere else. (Yes, even the “Native Americans” — Indians, if you prefer.) The human race started in Africa, and moved out from there. “In God We Trust,” shortened from “In God is Our Trust” from the Star Spangled Banner (our national anthem, which surely you remember was not written until 1814, late in the War of 1812), wasn’t adopted as the national motto by our forefathers, but rather by a modern Congress — in 1956, during the “red scare” — our fear of communism. Congress simply wanted to declare God was on our side, not them commies’. Before that, the motto was on U.S. coins, also for political reasons: to declare God was on the side of the Union, not the Confederacy, during the Civil War. That’s not just my interpretation, the U.S. Department of the Treasury admits it openly on their web site. I’ve written about this before, years ago in a post called Religious Freedom in the USA. Not that I expect Mayor Price to let inconvenient facts get in the way of his narrative. But if it was my choice, I’d get both “us vs them” and religion (including ‘In God We Trust’) out of government, as our forefathers clearly actually intended, and formally adopt E Pluribus Unum as our national motto. But alas, nobody asked me. When I Ran This Commentary in the Premium issue on Monday, the only “criticism” received was that it didn’t mention that “under God” in the Pledge of Allegiance was also added recently — in 1954. Yes, well, I can’t cover every point in every short essay, but there were so many, I’ll go ahead and cover that now. 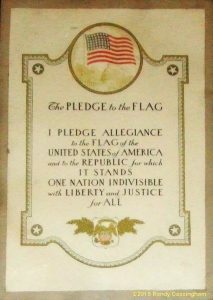 The Pledge’s wording from 1924 to 1954: Click to see larger. Near me is a historically protected structure — an old schoolhouse and, more recently, Grange Hall. The first time I had the opportunity to tour inside, there was something interesting on the wall, so the next time I took my camera to get a photo: it’s a framed copy of the Pledge of Allegiance, decorated with an American flag — a 48-star flag, which dates it between 1912 and 1959 (when Alaska was admitted to the Union). Notably, it does not include the phrase “under God”. Yeah, a lot of religious and/or patriotic folks will bristle at these simple facts, but not only is this oath completely politicized, but you do know the Pledge was written by a dreaded socialist, right? Indeed, Francis Bellamy (1855–1931) was a Baptist minister, and also a Christian socialist. Despite him being a Baptist minister, he didn’t include “under God” in the Pledge. His “flag salute” was specifically written for this nation of immigrants to salute our origin flags, not necessarily the American flag (the original text in 1892 began, “I pledge allegiance to my Flag and the republic for which it stands…” (emphasis added). In 1923, it was changed to read “the flag of the United States” to ensure loyalty from immigrants, but that wasn’t specific enough, so in 1924 the words “of America” were added. 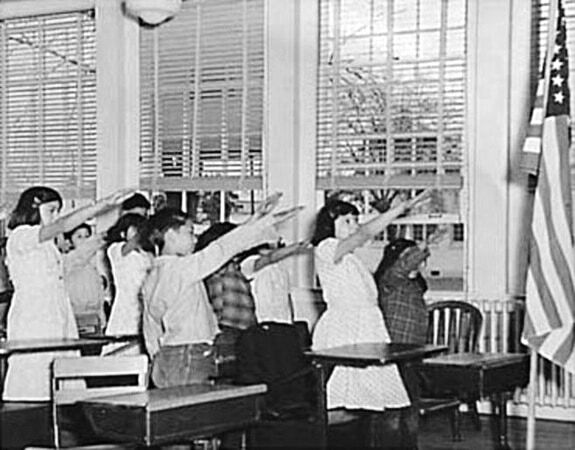 Children address the flag with the Bellamy Salute in 1941. Click to see larger. But wait, there’s more. 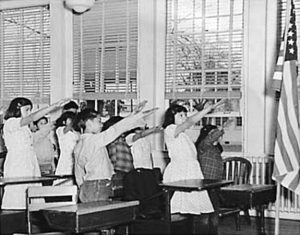 Bellamy had a specific salute for the kids to use when saying the Pledge; it was even dubbed the Bellamy Salute (see photo). Not surprisingly, that gesture was changed during World War II thanks to its similarity to the Nazi salute, and replaced by the now-familiar hand-over-heart. 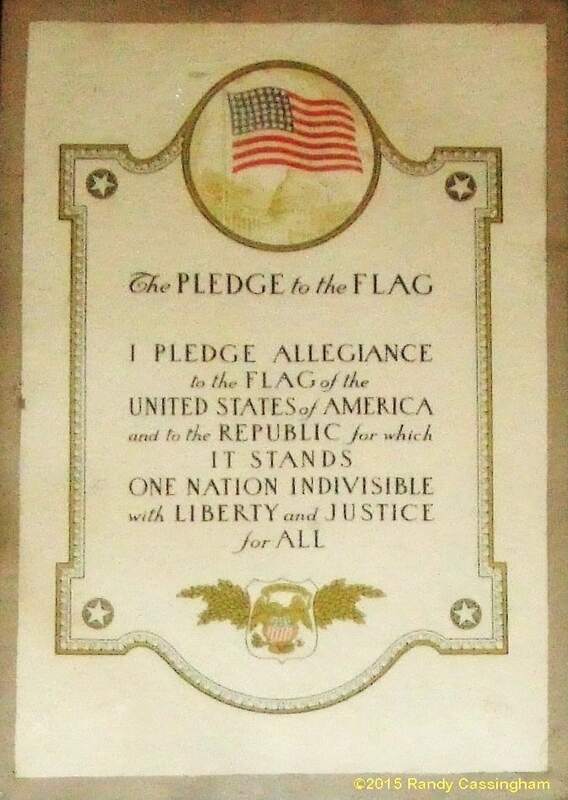 Still, Congress adopted the Pledge as official in 1942. Now that’s freedom of religion! So in some ways, Mayor Price is correct: we have drifted away from what our Forefathers set us up with. What, exactly, was that? “Believing with you that religion is a matter which lies solely between Man & his God, that he owes account to none other for his faith or his worship, that the legitimate powers of government reach actions only, & not opinions, I contemplate with sovereign reverence that act of the whole American people which declared that their legislature should ‘make no law respecting an establishment of religion, or prohibiting the free exercise thereof,’ thus building a wall of separation between Church and State.” (emphasis added), wrote Thomas Jefferson in a letter to the Danbury (Conn.) Baptist Association. In case it’s not clear, Jefferson is one of our “forefathers” who helped establish this country. The only true freedom is for the government to stay completely out of religion, as our forefathers wisely saw. People like Mayor Price seem to think true freedom is when their religion is institutionalized. Do you agree with his specific religion? Or the religion Congress comes up with? The vast majority won’t. So what’s the right one to adopt? None at all. Religion shouldn’t be subject to a vote, and it shouldn’t be dictated: only you should decide what’s right for you. And the flip side of that coin is, you should only dictate what’s right for yourself, not for me, not for your community, and not for the country. You want to be Baptist? Fine. You, or Mayor Price, or the government wants to dictate that you, or I, must be Baptist? Hold on there! That’s not freedom. Any questions? In response to this page over the weekend (by the Friday free-edition readers), there were 50+ protest unsubscribes, plus a few who lied and said that the newsletter they signed up for (and confirmed that subscription request) was spam, and reported it as such. Gee: bearing false witness — how godly of them! In the meantime, there were a half-dozen upgrades to Premium specifically in support of this page. All in all, then, the newsletter lost readers who don’t grasp that letting the government dictate what they are allowed to believe will destroy everyone’s religious freedom, except for the very few who happen to agree with the government’s take on things (and these are the same people who tend to think the government screws up everything! ), and would rather shoot the messenger than think about the implications of a truly important issue, vs. gaining readers who prefer to think — and support the newsletter that prompted their thinking. Sounds like a great tradeoff to me. “There is no other God”? What book was he reading? In the ten commandments god says ignore those other gods, just worship me. Not only does he state god”s” but he must have an ungodly ego to promote himself to the top position. I agreed with every word until the last part of the last paragraph. If I or the Mayor want you to be (insert religious preference here), that’s a matter between two individuals and doesn’t bring the government into it. Should I choose to, I’m free to attempt to persuade you to join whatever religion I like. You are in turn free to ignore me, argue with me, run me off your land, or join me. The “wall” only applies to the government, and as annoying as proselytizers can be, they have their freedoms as well. Thanks for another thought-provoking post, Randy! Thank you Randy. If only, in the US, the Christian masses understand this life would be simpler. Thank you, Randy, for standing true. (No pun intended.) I grew up during the era of forced nationalism. Although the laws were on the books banning forced participation in flag saluting and allegiance swearing, the South refused to obey the laws and continued the coercion. And Sadie bar the door when prayer could no longer be enforced. To me and millions of others, religion should never be linked with government. And don’t forget, this is the same state that passed a constitutional amendment that bans “all foreign laws” in an attempt to ban Sharia law. Unfortunately for the Christians who supported it, the amendment also effectively bans the Judea-based Mosaic Law found in the Bible. This effectively nullifies any Bible-based arguments in such controversies as gay marriage and abortion. You could argue that this new declaration is unconstitutional in Alabama. Richard from Ontario, I believe in the 10 Commandments God says “Thou shalt have no other Gods before me.” He doesn’t say he is in the top position, just that he is equal to the others. Randy, since people often argue that Jefferson’s “wall of separation” was in a private letter, not an official government document, you can always cite article 11 of the 1797 Treaty of Tripoli: “As the Government of the United States of America is not, in any sense, founded on the Christian religion…”. Loved your explanation, but you left out a group which also stands with the Jehovah Witnesses on not saluting the flag — Anabaptists. Being a Mennonite, we don’t have flags in our sanctuaries or “patriotic” songs in our hymnals. Then you have Amish (which came from Mennonites) who are even more strict than us. And yes, many of us are against serving in the military. Myself, I don’t pledge to the flag or vote. Being a teacher’s aide, I have to explain to some of the students and other teachers the reason I don’t salute the flag is because my allegiance is to Jesus Christ, NOT the United States. The truth of the matter is that too many don’t understand that there are people whose allegiance is to a higher power than any fleeting government, no matter what name it goes by. Good article, Randy, but — as often happens — stating “absolutes” leaves room for loopholes. Now, both in general and specifically, I believe in the separation of church and state, but as a practical matter, doesn’t that mean that laws granting churches — or religious establishments — or “church” property — freedom from property taxes are unconstitutional, and that churches should pay the same taxes that I have to, or a business has to, if we all (each) own property? How can tax exemption be viewed as anything but government support of religion? Thanks for mentioning the Jehovah’s Witnesses kindly. We sometimes do not get honest reporting. Of course, I would expect nothing less from you. Please remember that this wording reflected a compromise among the Senators and Members from the thirteen states. At the time, most States had a state religion. Massachusetts was Congregational (the Pilgrim’s church, now UCC). Maryland was Catholic. Virginia was Episcopal. Pennsylvania was officially neutral; most of the Quakers went there due to Penn, but many other religions did too (from the Dunkers to the Mennonites). The amendment requires Congress, and thus the Federal Government, to stay out of the States’ ability to set state religions — so no state, and no religion, would win out at the federal level and become a national religion, supreme over those religions of other states. It’s a States Rights clause — not a clause to make all governmental levels non-religious. Thank you Randy; I often start to despair of finding common sense and historical accuracy in discussions over religion in the USA, but comments like yours help …I’d say restore my faith, but we don’t want to go there. For me, the most important aspect of freedom of religion, is freedom from religion — of any flavor. Religious people seem to have little respect for this. It’s not that strange, since they believe they’ve got it right. More so, most religions dictate that their followers recruit new followers in one way or another. The trouble is that doing so, is in fact a violation of other peoples rights of freedom from that particular religion. Also, freedom of speech trumps freedom of religion at all times. Religion is a base of power, and no base of power should be allowed to silence criticism against itself. What people like this mayor seem to forget is that the separation of church and state was done to protect the church, as well: a state-appointed religion allows no freedom of worship, and how many church-goers want the government interfering with them? The comment about tax-exemption begs a reply. Churches are charities: they provide counselling and support to the poor, addicts, depressed, and bereaved (at least mine does — and we’re always broke). There is a lot going on behind the scenes that someone never involved in it doesn’t know about. What an idiot! Doesn’t Price realize that he just blew everyone’s cover? I mean, we’ve been hearing for years now that America’s Constitution is a godly constitution based on godly Christianity, and Price has just shown that nothing is further from the truth. What’s that, you ask? How does this prove the Constitution isn’t based on Christianity? Simple. If the Founding Fathers had intended America to be a godly Christian nation with a godly Christian constitution, they’d have made specific mention of that in the Preamble. Price’s ghastly attempt at representative, compulsory Christianity gives us the precise wording required to ensure God’s place as king of America. And yet, there is no mention anywhere in the Supreme Law of the land, of God, or Jesus, or Christianity. There’s a specific prohibition against requiring a religious oath of anyone elected or appointed to any governmental position. There’s a specific prohibition against compelling the practice any religion or prohibiting anyone from freely engaging in any religious practice if they so choose. But somehow our godly Christian Founding Fathers dropped the ball. Wow! Actually, it’s not surprising that our god-minded religious leaders like Pat Robertson, and Bryan Fischer, and the late Jerry Fallwell have tried so strenuously to sell the con job of a godly Christian Constitution. After all, if they can successfully sell that sneaky lie, then who will be the arbiters of Christianity? Who will decide who is really Christian? In short, who will get to be in charge? And if the Supreme Law of the land is a godly Christian law of the land, why, all paths lead to glory. Equality for homosexuals? Nope, not in God’s godly Christian Constitution. Freedom of religion? If you’re not one of the true elect, then nope, not in God’s godly Christian Constitution. Equal rights and freedom for women? Nope, not in God’s godly Christian Constitution. Equality for African-Americans (the Sons of Ham — i.e. slaves)? Nope, not in God’s godly Christian Constitution. Freedom of choice? Nope, not in God’s godly Christian Constitution. And so on, and so on, and so forth. The next time one of the pseudo-Christian blowhards tries to sell this bill of goods of how America’s Constitution is a godly, Christian Constitution, point to Mayor Price’s forcible conversion statement to see what the Founding Fathers should have written if they’d really meant us to bend the knee at one particular myth. Why has it not occurred to people of the various religions they are all worshipping the same God whatever their name and image of him/her/it may be; and that while religions require a God, God has no need of religion. I am pagan by the way and polytheistic. Like many arguments it is true only if you pick and choose your facts. While the literal phrase “In God We Trust” as chosen by Price can indeed be successfully debated, the ignored facts are also interesting. On the “other side of the coin” obviously if you want to go further back than the Civil War or coinage, you can start near the beginning — God being in the very first paragraph of the Declaration of Independence. Starting with Delaware as the first State to Hawaii as the most recent, God has always made an appearance. A bonus eye-opener at the bottom: many States forbid you holding office if you DON’T believe in God. My belief is that the dialogue that is far more interesting is God as opposed to religion, but that’s just me. Jefferson’s first draft didn’t mention anything about any God. When others said they wanted it in there he relented to the extent as to say “our Creator.” His view of God was just that … a creator who then left it up to us as to what we did from there on out. He wasn’t even a Christian. He thought Jesus was a good man who had a lot of good things to say, but he didn’t believe in him as the Son of God or the miracles. Do a quick Google on the “Jeffersonian Bible” to see what he pulled out of the Bible that he believed in. I doubt it’s what many would like to think. Many of the Founding Fathers (and more than a few since then) were the equivalent of what today are the Unitarian/Universalists. God the Creator, but not the Overseer. Since the 14th Amendment applied the rest of the Constitution to the states as well, the Constitutional ban on requiring any religious test for holding office should also override any state requirements. Separation of Church and State? To serve all people, government must allow for compromise to best protect varied needs and interests. Adherents of a religion tend to embrace absolute truths, specific interpretations and rules for life and death. Prevailing religion(s) will have majority control of government(s) and will implement laws to impose their rules for life and death upon everyone, because they are absolutely certain of the rightness of their views. Government is a reflection of the public majority which elects its members. Candidates both appeal to and influence their constituents based upon visceral (mostly faith based) views of issues. A majority of the public hold absolute views which they would not compromise, elect public officials with the same uncompromising views, then complain because the likes of a Congress fails to get anything done. Who to blame? Whatever political figure(s) is perceived to not hold their same absolute views. The more secular the population, the greater is the tolerance for varied faiths, beliefs and lifestyles, and better are the chances for compromise in government and community. A comments about the tax exempt status: I was taught that part of the reason churches are exempt from taxes is because the amendment states that Congress shall “make no law respecting an establishment of religion, or prohibiting the free exercise thereof” and that includes taxing churches. Fording churches to pay taxes may lead to prohibiting the free exercise of religion: other countries have been known to tax churches they didn’t like out of existence, so making churches tax exempt is a way of protecting religious freedom. The Star Spangled Banner was a patriotic song for a very long time before it was the National Anthem. It was not adopted until March 1931 as our National Anthem. Before that we did not have a National Anthem. The tune was called Anachreon in Heaven, an older song. I lead a Civil War Brass Band (now called the Colorado Frontier Army Band) which plays the version played at the surrender of Union troops at Fort Sumter, the first battle of our Civil War. It is slightly different than our National Anthem version. Outstanding post, Randy. This sums up the situation very nicely — and is one of the best explanations I’ve ever read. With regards to Deb’s comment about churches being charities — that’s certainly true in the US, to a point, but as tax-exempt organizations, they are prohibited by US law from participating in certain activities as well, such as endorsing political candidates. Doing so violates the US tax code, and the IRS should revoke the church’s tax-exempt status if they engage in activities that are prohibited by the applicable laws. I was young and impressionable when Madelyn Murray was holding forth. My mom (a very smart lady) cut the arguments. “You want prayer in school, who is going to write that prayer”? I thought about that short statement for a while. I have also applied that sentiment to other dust-ups since. Moms are good at cutting to the chase. King George III was, like King James, “By the grace of God, King of Great Britain, France, and Ireland, Defender of the Faith, etc.” I can see why the “Founding Fathers” were especially careful to avoid reference to power being granted “by the grace of God.” In the Declaration of Independence they submitted: “We hold these truths to be self-evident, that all men are created equal…with certain unalienable Rights, that among these are Life, Liberty and the pursuit of Happiness. That to secure these rights, Governments are instituted among Men, deriving their just powers FROM THE CONSENT OF THE GOVERNED.” (emphasis added) And the preamble to the Constitution states, “We the people…”, NOT “By the grace of God…”. From a non-US point of view, this sort of thing doesn’t surprise me at all. In order to succeed in politics in America, you have to be a “man of faith” and openly assert it at every possible opportunity. Even totally obvious frauds like Mormonism get taken seriously in the political arena. Seriously, you lot would rather elect a stupid believer than an intelligent atheist. Not only did you elect George Dubbya, but you did it twice!! I don’t know what is more embarrassing — the fact that you elected him for a second term, or that the Democrats couldn’t provide a viable alternative. This is a far cry from when Kennedy, as the first Catholic (i.e. non-WASP) was running, as there were concerns that he would take orders from the Pope. He (Kennedy) went to lengths to put distance between his politics and his religion. The reason why your politicians spout their religious beliefs today is because it goes down well with the voters. To a certain extent, you really do get the politicians you deserve. That is by FAR my favourite ever edition of True. And I’ve been subscribed via one address or another since about 199something. In fact I was a Premium subscriber for some years until a lifestyle change forced me back to the free edition. I did always follow your suggestion by forwarding copies to several people with the recommendation to sign themselves up but today I am back on your premium list for a number of reasons. 1. Your story taglines, this week, reached new heights of sharp, truthful, direct, humourous of course but especially fiercely challenging. I normally find about one of your taglines each week chimes with me but today’s read like a tidal wave of blows, each dropping my jaw even further at your boldness. 2. You kept on going, as you always have, telling what you see like you see it regardless of the ire you must be stirring in some people. As I read on I could feel the unsubscribes rolling in and determined to add what I could to counterbalance your losses just as soon as I got home, because your views need to keep getting heard as widely as possible. So I didn’t even reach the bit where you said ‘subscribe please’ before scrolling down to the paypal link. As an additional bonus, I’d like to point out that in Torcaso v. Watkins, 367 U.S. 488 (1961), the US Supreme Court held that unbelievers are entitled to the same rights to religious freedom (i.e. NOT being required to declare a belief in any god they don’t accept or believe in) as believers. In short, the compulsory declarations of belief that Dan is referring to are prohibited by the Constitution, THE supreme Law of the land (article 6, section 2). I would also point out to those folks who want to remind us, smilingly, that the “Tenth Amendment guarantees State’s Rights”, that the Fourteenth Amendment also states that every clause and section in the US Constitution also applies at the state level. That means that no religious oath can be required for public office. This includes being required to declare a belief in any god or gods of any sort. Okay, I admit that being agnostic on religion I’m biased. But frankly, given the attitudes of religious fundamentalists, I’d rather have an unbeliever in office, than a believer of ANY religion. At least an unbeliever won’t go out of their way, ala Mayor Price, to either favor, or force one particular version of one particular religious belief down everyone’s throats. Essentially, I’m more inclined to trust someone who holds the view that there isn’t one “correct” belief, than someone who holds the view that there IS one “correct” belief (which, of course just happens to be their own). Believe if, and what, you want. Just don’t use the law to force everyone to embrace what you believe. With regards to Torcaso v. Watkins, 1961, even though the USSC ruled that Maryland’s Article 37 requiring a belief in (the obviously Christian) god to be allowed to hold office was unconstitutional, the state constitution still requires such a belief. I have one question: If I legally changed my name to God could I take ownership of Winfield, Ala.? Boy wouldn’t that stir up a Hornet’s nest. Great write up Randy, Too bad there will be those who just don’t get it. Since the resolution states: “We acknowledge that at all times, He is in control.” shouldn’t the Mayor and the city council, indeed the entire city government, resign in favor of God? It seems to me either God is in control and making the decisions or humans are — which is it? Butch asks an intriguing question; just which “God” owns Winfield? Thanks all, and Randy, for the thoughtful discussion. There are really some interesting points made. So, now that the serious discussion has been had…. Ah, and there is the rub, the lease specified which one tree to leave alone. But as they unsubscribed, I resubscribed, now that my finances are back in reasonable shape again. I hope there are others who realize the same and do the same…. Some of your statements offend me; until I get over it. Some of your stories make me angry at idiots; until I get over it. Some of your stories make me groan in deep spiritual anguish; until I get over it. Gee, maybe people should get over themselves. Keep up the good work. I remember when “under God” was inserted in the pledge; I found it objectionable then, and I still do. But I was in the Army then, and I had learned that it was impossible to piss up a rope. By the way, during that period, the Army required all soldiers to sign a loyalty oath. Again, it was clearly impossible to micturate up a vertical cordage. I enjoy reading your mailings, especially the comments section. I am a Christian myself, and I’ll just say I’ve come across things I don’t necessarily agree with, but it’s not something to unsubscribe over. Heck, I don’t even get offended. Derek in Germany, not quite sure why you feel you have to make the gratuitous slam at Mormonism; I could understand it if you picked Scientology, but Mormonism seems to be on at least as solid ground as any other “divinely inspired” religion. However, you need to check U.S. history a little better. JFK was NOT the first Roman Catholic to run for the presidency, he was just the first elected to that office. Alfred “Al” Smith ran as Democratic candidate in 1928. Don’t know myself if there may have been any third party candidates earlier, but I believe Smith was the first for a major party. I am saddened by the response to your items about the USA ‘pledge of allegiance’ in the two recent ‘This Is True’ issues. I read them and was forced to conclude that too many of your readers cannot read with understanding. Sad observation of the literacy of Americans today. Your readers are select audience. I believe a random sample of Americans would have been worse. Perhaps it was all a demonstration of cognitive dissonance–the mental fog that rejects data in conflict with personal beliefs. I found the story about the Mayor of Winfield very useful in a discussion with my grandson, who is now shopping for a college to prepare him to be a high school history teacher. I am retired Christian minister with BA as a history major. I used your ‘This Is True’ #1075 to point out a major landmine for history teachers. Many of their superiors are ignorant of history yet feel fully qualified to tell them what to teach in a way that they would never tell the calculus or Latin teacher. And if that boss is an elected political figure like the mayor or a member of the school board, their authority is nearly unchallengeable by the history teacher. Saddens me. But Jesus never promised me people would be reasonable, love them anyway. Thanks Randy for your very good newsletter. It was well written, and the stores were interesting and thought-provoking. There are some people in every religion who take their beliefs too far, and it becomes a mental illness for them. They can no longer think rationally. More people have been harmed and killed in the name of religion than for any other reason across history. Why can’t people just be good and fight bad because it’s the right thing to do? It was because of this item that I decided to upgrade from Free to Premium. I have never seen Freedom Of/From Religion stated so clearly. “Freedom of religion” MUST include the freedom to be agnostic or atheist, or to adhere to any religion the individual chooses. As an atheist, I do not force my beliefs on anyone (and yes, they are beliefs, as valid as any held by an adherent of a deity-based religion). In return, I do not expect to have anyone else’s beliefs forced onto me. I am an agnostic who has no problems with God. Just with churches and their paid employees claiming the right to determine what is “right”. Reading your commentaries, Randy, makes me regret signing up as a premium subschriber last year. Mainly because I should have done it years age and secondly because I now cannot show support for you by signing up. Keep up your thought-provoking work. It does worry me though, that I hardly ever disagree with you. I have pretty confident guess, but, what was the split on premium protest unsubs, vs. Free? Add me to the list of those thanking you for speaking reason. You know… I`m experiencing a very weird mix of feelings right now. One part horror, two parts incredulous shock that while I’m right now living in the country in the middle of civil war, I still find that preferable to this quaint little town in Alabama. It seems to me that mayor just doesn’t grasp how shameful this resolution is. How much it says about their incompetence as citizens. I`d understand if they behaved as our cutthroats here — indifferent to the plights of people they seek to govern and nonchalant about it. The thing is, I`m rather sure mayor and council sincerely believe they’re doing everyone a favor with this. Verily, there is no evil more horrible then that wrought by those who believe they’re doing the right thing. @Tom in Decatur: You asked why I took an easy shot at Mormonism and not scientology. Well, as far as I know, no scientologists were presidential candidates recently, whereas Mitt Romney was. I actually agree with you, that Mormonism is on at least as solid ground as other “divinely inspired” religion, but only to the extent that (imvho) they’re ALL bogus — and let’s not forget that Joseph Smith was wanted for fraud. Also, try and read the “revelations” with an open, even skeptical, mind and you’ll quickly realise why people don’t take Mormonism seriously. Thanks for the historical correction — always happy to learn something. 1. Jesus taught acceptance of others for what they are. 2. St Matthew, Chapter 22, verse 21 — different Bible versions have slightly different wordings, but in it Jesus tells people to ‘Give unto Caesar that which is Caesar’s and to give unto God that which is God’s’ thus making it clear you should NOT mix or impose civilian government matters on God, or God on civilian government matters. In short, he advocated the separation of church and state. Sadly, what you have today is a lot of people who claim to be Christians but follow non-Christian edicts from church leaderships who like having personal power. The same can also be said of many other religious leaders. I recently told my brother (a Southern Baptist) about narrowly avoiding an accident on the interstate. He replied that God had saved me from injury. I asked him if that was the same God who allowed thousands of innocent people to perish due to earth quakes and tsumanis. He replied that it was indeed the same god. I told him that if God rides with me he has to wear his seat belt. I’m currently homeless, but when I get my life sorted out, I’m going premium and this is why. It just might take a while. Until then, whenever I scrimp up some Internet access, your newsletter is my first stop on the computer. If I honestly and sincerely believe that I am Napoleon Bonaparte, I’ll get locked away. If I honestly and sincerely believe that I am the direct representative of the Creator of the Universe and that everyone else must govern their lives according to my personal whims and prejudices, I have Freedom of Religion. Does anyone else remember that many public officials take their oath of office with their hand on a bible? And say “So help me God.”? Not much separation there! Why in the world would I want to subscribe to anything that didn’t occasionally get my hackles up? I don’t always agree with you, but I DID know what I was (re) upgrading to when I could once again afford it. I am a conservative, both fiscally and politically, and I am a Christian. One of the things that means to me is that I must always set out to be a good example to others. We are called on to love our enemies. Not always easy, but it sure confuses the dickens out of them. From where I am, keep up the good work, and thank you for your EMT service as well. Takes a special kind of bravery to do that. Very interesting story and comments. Regarding the mayor and the upset unsubscribers, here’s my take: many of those who proudly and loudly wear their I’m-a-Christian status on their sleeves aren’t actually Christians. They are Old Testamontians who pray ‘in Jesus’ name’ but don’t follow in his footsteps. I get it now. No one’s “right” should trample anyone else’s right. Freedom of Religion IS Freedom FROM Religion, because it’s religious freedom that allows people to not be religious. Randy, you’re better at this than I am…’splain it to the masses….